High Absorption CoQ10 contains pure, vegetarian coenzyme Q10. CoQ10 is a nutrient that supports heart function and promotes energy production in cells. * Bioperine, an herbal extract derived from black pepper fruit, promotes absorption of nutrients in the GI tract. 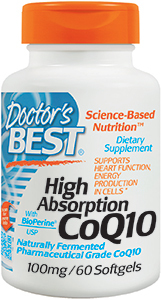 Preliminary studies have shown that Bioperine increases CoQ10 absorption. Since the coenzyme is lipophilic (fat-loving) its absorption is enhanced in the presence of fats. However, when taken as a supplement apart from meals, the absorption of some formulations is lower. CoQ10 is found in the mitochondia (our energy producers) of each of our cells in the body, but a role beyond the mitochondria is also acknowledged, with CoQ10 acting as a potent antioxidant it reduces free radicals, which helps widen blood vessels (vasodilation). While the majority of research has focussed on the role of CoQ10 in cardiovascular health (especially heart failure and high cholesterol), research also links coenzyme Q10 to benefits for Parkinson's and other mitochondrial diseases, diabetes, cancer (breast, lung and prostate), male infertility, and kidney failure. Statin drugs, prescribed to lower cholesterol, are known to lower CoQ10 levels in the body. Therefore, supplementation of CoQ10 is strongly encouraged. Suggested intake: 200-300 mg daily, higher for Parkinson's and other mitochrondial diseases.